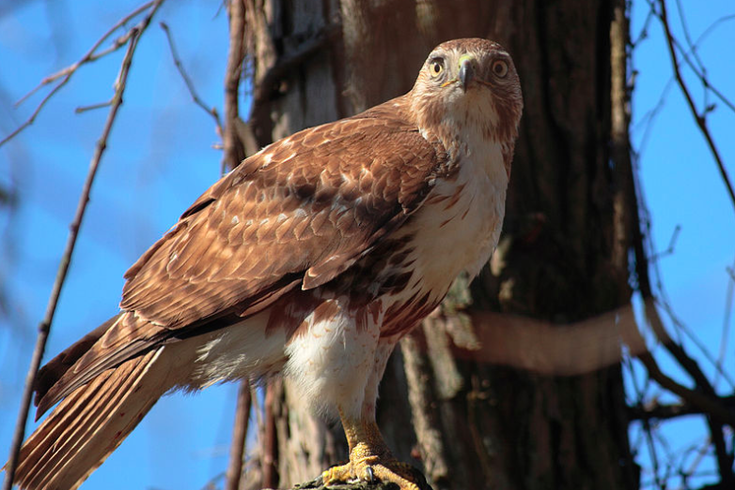 A red-tailed Hawk at John Heinz National Wildlife Refuge at Tinicum, Pennsylvania. An unexpected guest made a surprise appearance last week at Phoenixville's popular Great American Pub, prompting police to respond to the scene at the behest of the executive chef. The incident occurred last Tuesday at the downtown restaurant on Bridge Street, where employee Anna Olvera reportedly felt a bird of prey latch onto her hair, according to FOX29. Olvera was returning indoors from the pub's patio seating area when a red-tailed hawk cleaved to the bun she'd tied, taking a ride inside the pub. Police released footage of the incident police on Tuesday and it was later wrapped into a segment from the local TV station. Great American Pub General Manager John Saksos reportedly called 911 for assistance with the bird, but it was ultimately maintenance man Justin Chapman who came to the rescue. With a large black tablecloth, Chapman cornered the hawk in a stairwell, trapped it and freed it outside, where it temporarily landed on a sculpture of an eagle. Saksos said he's never seen anything like this episode during his 30 years in the restaurant business.